On March 1, 2011 the Federal government issued their final updates to the 2011 Form 941 (here’s a PDF of the draft copy). The Sage ERP MAS 90 and 200 team is coding to this updated form and will release the change via a Hot Fix for Payroll versions 4.4, 4.3 and 4.2. Users of versions prior to 4.2 should be aware that the form updates (as well as tax tables) will no longer be maintained for those unsupported versions. These changes will also be incorporated into Product Update 5 for Sage ERP MAS 90 and 200 version 4.4, and Product Update 22 for version 4.3. This updated 941 payroll form makes required changes for the legislation in the Tax Relief, Unemployment Insurance Reauthorization, and Job Creation Act of 2010 that reduced the employee Social Security rate from 6.2% to 4.2% for one year, effective with wages earned beginning Jan. 1, 2011). Also included – changes from the 2010 version: elimination of lines for the payroll tax exempt. in the HIRE Act (lines 6a-6c), because the exemption may not be claimed on wages after Dec. 31, 2010; (2) removing the advance earned income credit line (line 9), due to the advance earned income credit not being eligible for claim after Dec. 31, 2010; and (3) the addition of a new line for the FICA tax due on unreported tips. 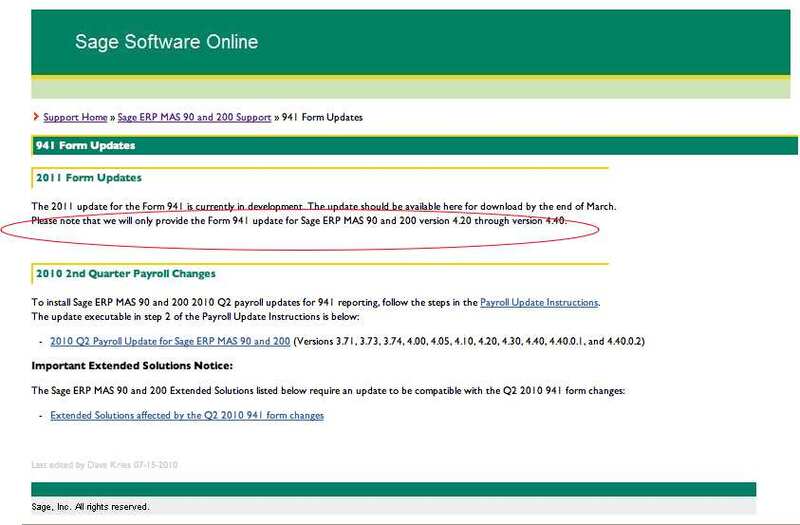 Some information from the 2010 form 941 have been put on different lines (e.g., quarterly adjustments for sick pay moved from line 7b to line 8). 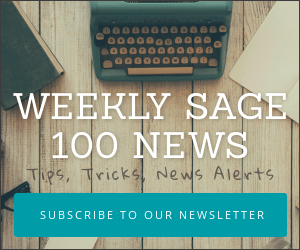 The hot fixes and product updates are currently targeted to be posted on Sage Online, Sage ERP MAS Support section close to the end of March 2011. In addition, the Q2 2011 Tax Table Update is currently targeted to be posted at the same location at approximately the same time. Please check the download site or the Sage MAS Community forum throughout March for additional late-breaking information.